Many related file functions, not as many options to actually print directories. Directory Report makes it easy to print directories. It also has plenty of extra functions, such as finding duplicate files, synchronize and comparing folders, as well as several other reports. You also have several filters available. 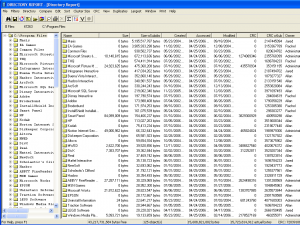 You also get some disk usage functions, such as finding largest directories and files. Featured Software	Print your Directories quickly! Print and visualize your directories. Find out where your hard drive space went – and all your hard to find junk files.